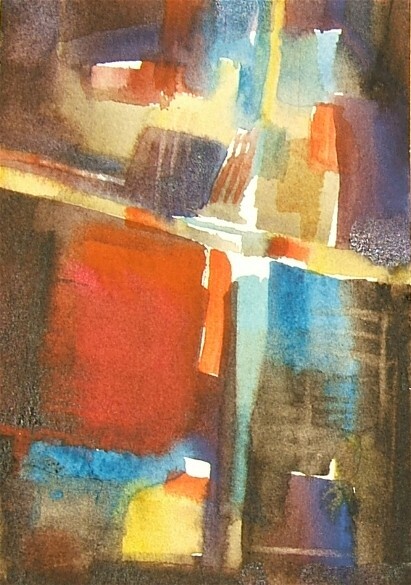 An Abstract painting (4 by 6 inch Postcard size) of watercolor on paper. This little gem has a companion piece which I will put up soon. 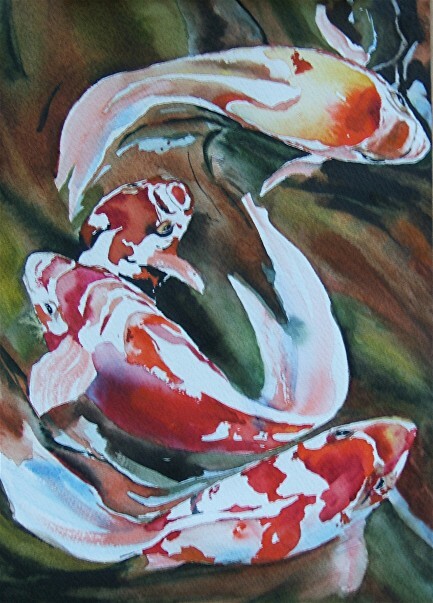 I like to paint two paintings at a time because it helps watercolorists to work this way and avoid overworking the paint. I love this combination of warm colors with the cool colors. If you like to name paintings, I would like suggestions for these abstacts. 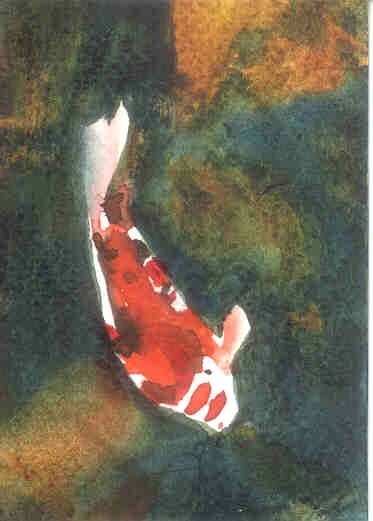 This is 4 inches by 4 inches $50.00 and it has a companion piece, which I’ll put up tomorrow. 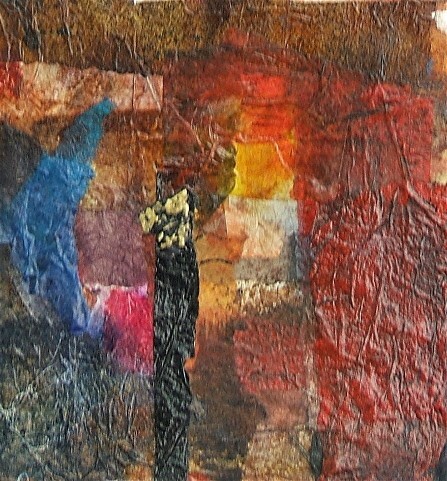 I made this paper by painting watereddown acrylic over art tissue paper, letting it dry and then putting it in the blender with water till it turns into a slurry. I tore it and painted it onto 100 % rag watercolor paper. Then stained it with watercolor and finally, I covered it with gloss medium for the shine. This painting can be hung either this way or it can be hung landscape (the other way). It looks good either way. I changed my palette, this is more brown and green and I like it for a change. (vicodin). He continues to take his morophine yet he is so much more awake, we even went out to lunch. I also dropped off “solitude” and “waiting” for an art show at the art league, the city is having a grand opening for our new light rail which goes right by our gallery. The theme is City life… I figured these two-paintings best fit the theme. You can put their names in the search at the right and you can see these paintings. I’m calling this little guy Chubbs, he is a stout fish. 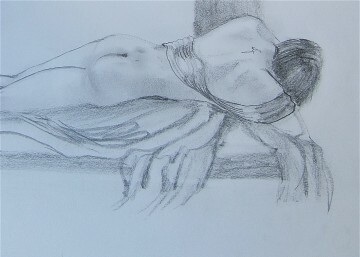 This is the five minute warm up drawing of Michelle our model for this Saturday. I have drawn her before and she is very good with coming up with the poses. This is a twenty minute pose. I cropped off the feet because I didn’t line up the sketch book sure with the camera lens. I wanted to show you at least one close up and one shot as you would see it as if you were looking thru the book. This was the first time in four months that I have drawn from life, I enjoyed it after being out of it for so long. I painted this and a few more to sharpen my skills. 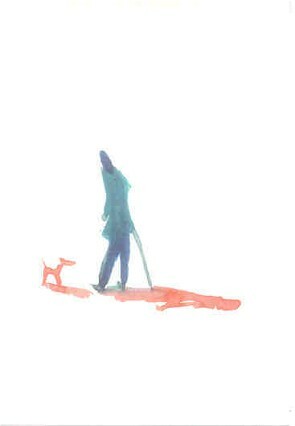 I like to paint these little figures of people. They are very expressive without the detail. I’m going to the Queen’s University show tonight as I’m putting on a show for the guild of Charlotte artists and everyone is waiting to hear who the winners will be. I think we had a great turn out and I hope everyone will be happy with the results. Here you can see I drew the fish in, I don’t always do this but since there was going to be so many fish on such a small piece of paper I thought I should make sure the spacinging was good. this is 11 by 15 and I’m trying some new colors for my water. I lean towards the brighter colors but this muted green and burn’t sienna should be very nice. I’m going to put some sepia in there to to punch up the values. 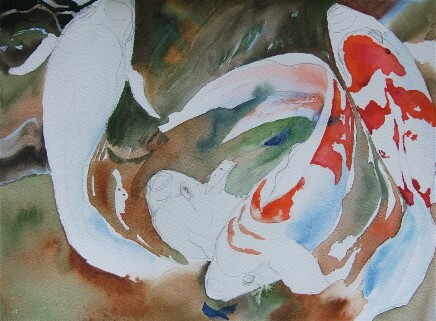 I dropped my brush near the koi in the center’s mouth, I’ll go in and fix that later.